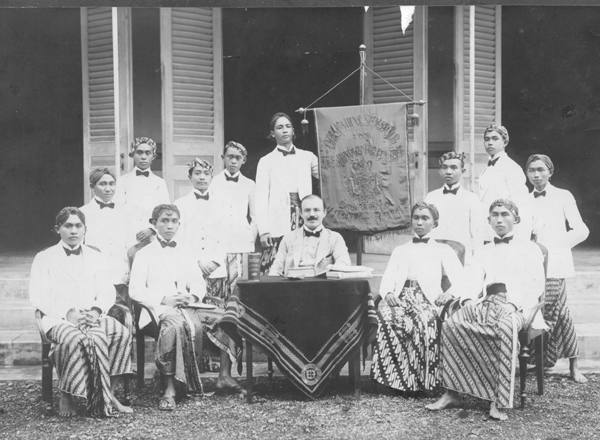 Some 3 years Ies worked as a lawyer in The Hague; perhaps because he was not too succesful, (the first world war contributing to a situation not favorable for starting entrepreneurs), perhaps because of the prospect, that in the colonies Jewish origin played a minor role, Ies and Lien left for the main Dutch colony of the East Indies, nowadays Indonesia. 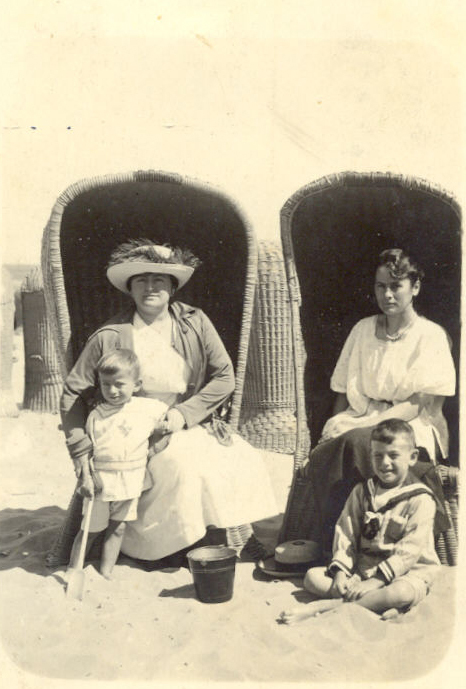 They arrived there on the Dutch East Indies in the first half of 1915. 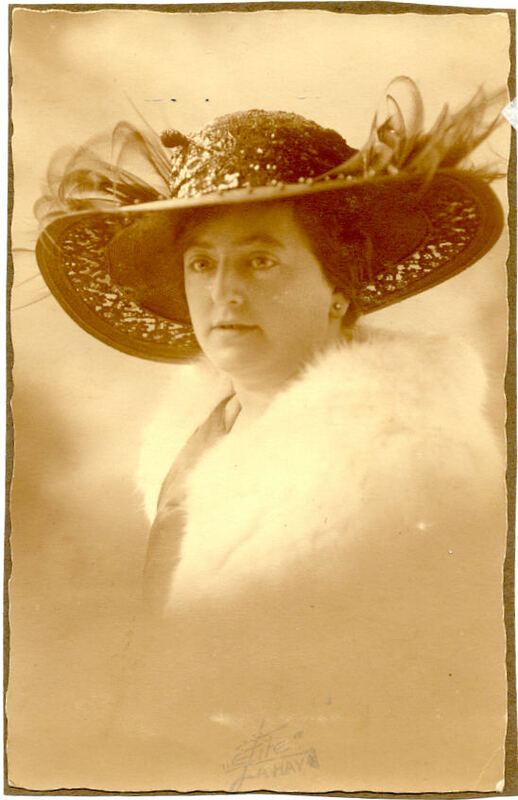 Lien was pregnant of her eldest son Max. 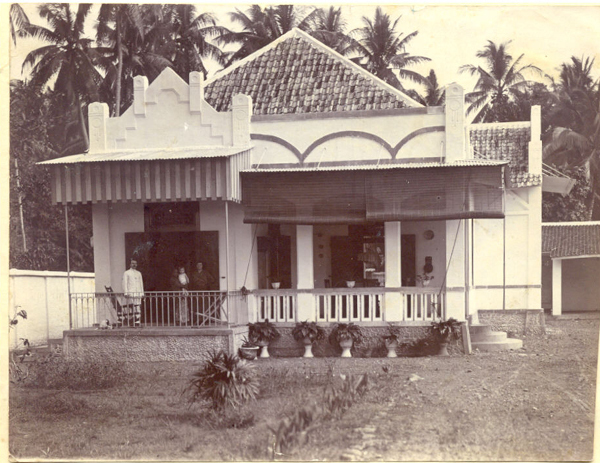 first house of Ies and Lien Cassuto in Indonesia, Pekalongan, on the isle of Java, in the middle part situated at rhe Java sea. 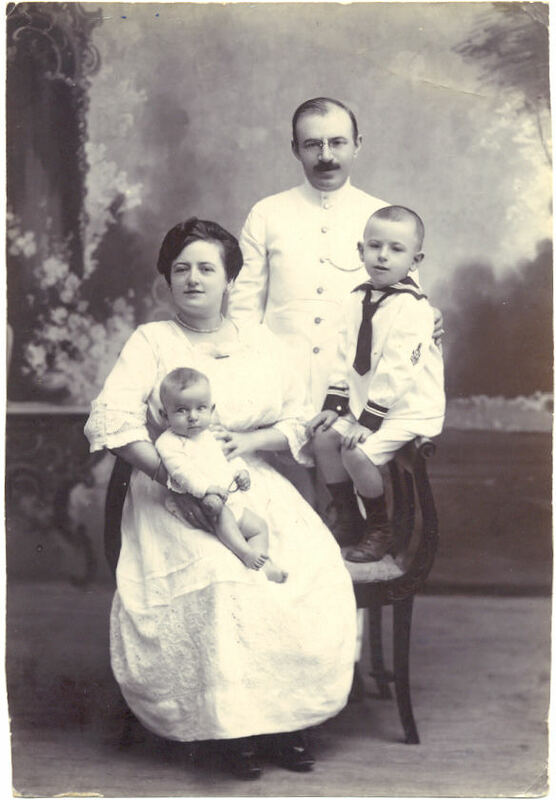 The first months, more then 10, they lived in a hotel, then moved in this house ("op Bermi"), but they moved to another house in December 1916, "because at Bermi they often stole", as Lien wrote in the baby book dedicated to first born baby Max. 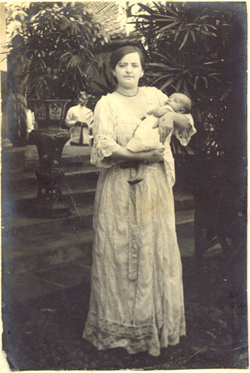 after the birth of Max Cassuto in 1915, Pekalongan, on the isle of Java, his mother Lien Cassuto-Winkel kept a baby book; on page 2 - see above - she describes the food crsis with the two month old baby Max; he didn't accept the food from mother and the porridge prescribed by the doctor and mother travels with the baby to the big City Semarang to consult a specialist. 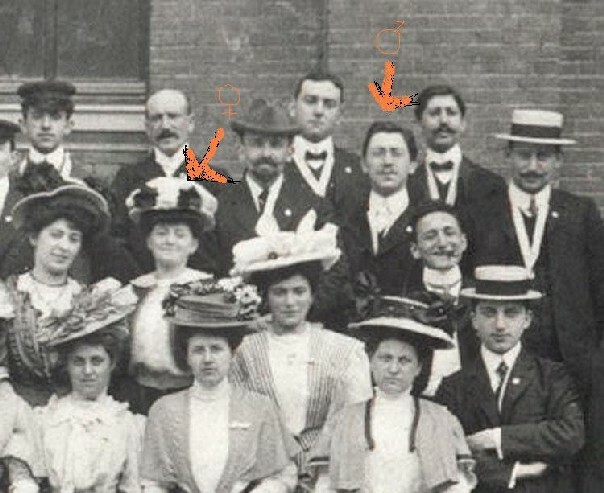 She stayed with her sister Annie who apparently too lived in Indonesia with het sister in law mrs. G. Cohen in the town of Semarang. first he got "apepokken" (Monkey pox?). He refused to drink and eat. Then Lien fell seriously ill and had to be nursed in a clinic in Semarang, Max was half a year and had to be taken care of by a friend of Lien for several weeks. Just after his second birthday he got "terrible pustules", which lasted for 3 months. 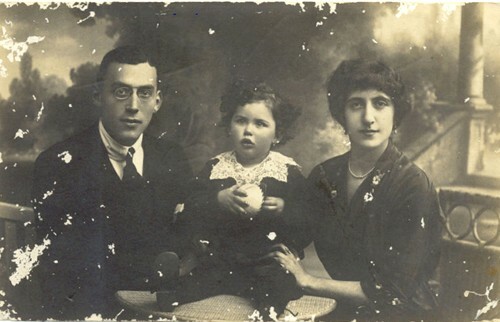 After that an automobile bumped at the cart he drove in with mother Lien, which caused some head injuries, though not serious; little Max reorted to everyone in Maly language: 'auto kena glinding"
This is Annie with her first husband Cohen and daughter Lydia, picture I estimate to have been taken in 1916. 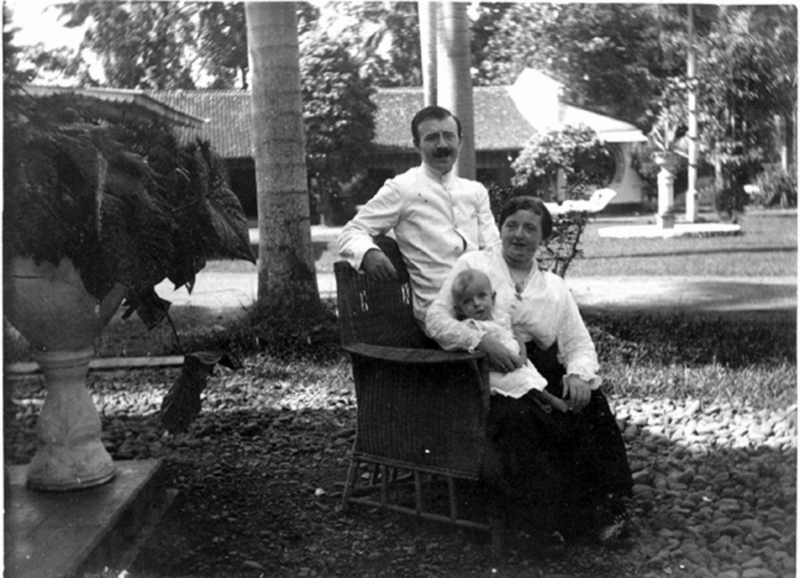 In 1917 she visited Indonesia with Lydia and her baby son Dé and stayed for some time with her sister Lien in Pekalongan. 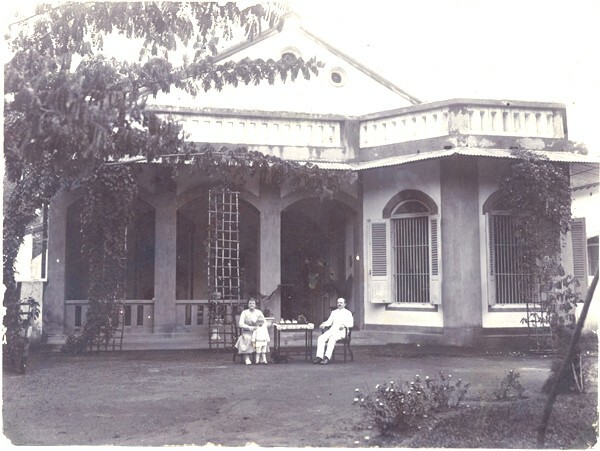 In November 1917 Ies was transferred to Probolinggo, in the east of Java. I suppose he was already, as later he was, employed in education. Shortly after moving to this new place Ernest was born. In the babybook less then half a page is dedicated to Ernest. 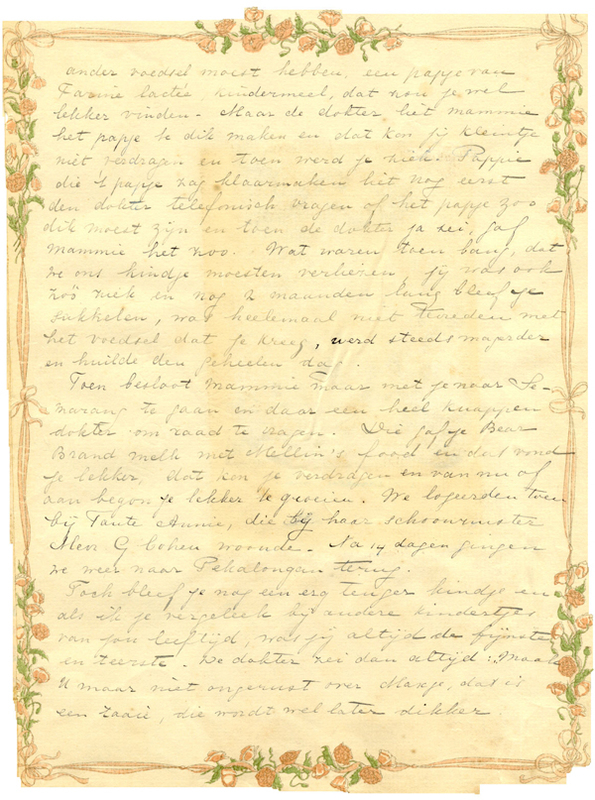 She writes: "all alone you came in the world, no doctor ot nurse attending. You were such cute and sweet baby, always good and never a bother. You could tolerate Mommy's nourishment very well and you grew firmly. All was so different compared with Max with whom we had so much worries"
Probolinggo, Cassuto's with friends; I guess the about 5 year old boy is Max, flanked by his parents. 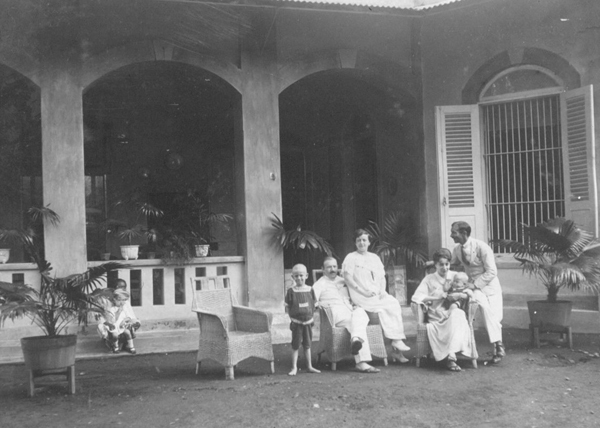 Possibly the toddler at the left is Ernest, on the lap of his Indonesian nurse, called 'babu'. The role of these nurses in child life at the time cannot be underestimated. The child spent more time with his or her babu then with his or her mother. Lien writes about Max: "In Probolinggo Mommy had to look for a new babu and there babu Mah entered the family. 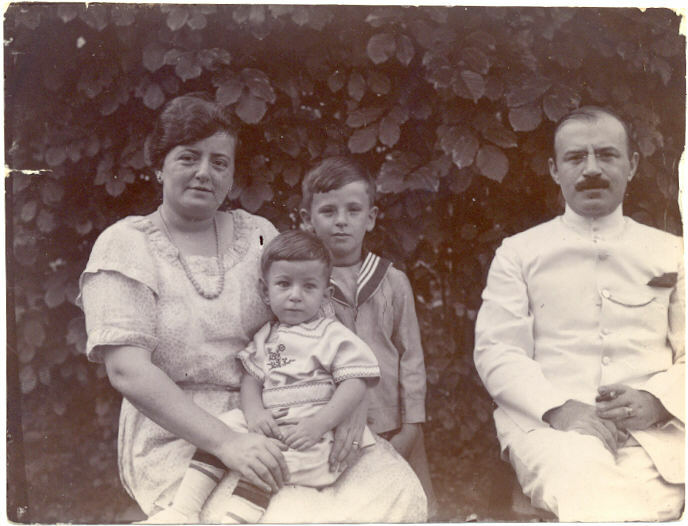 What a good old maid she was and how she loved njo (short for 'sinjo', young gentleman, originated from Portuguese senhor) Max." 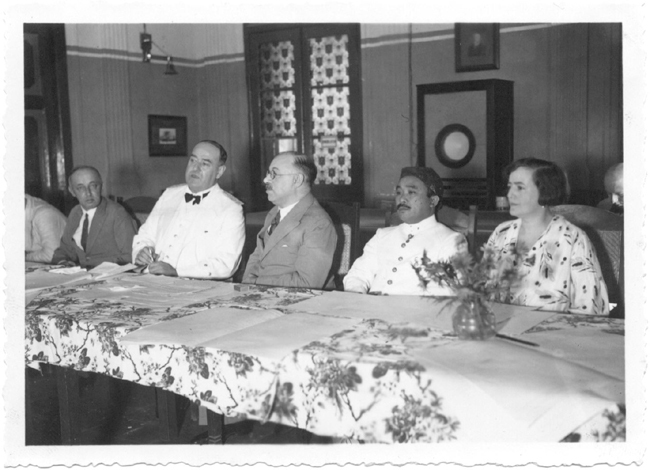 Most of the time Ies Cassuto was teacher and later director of schools for the education of indonesian civil servants. 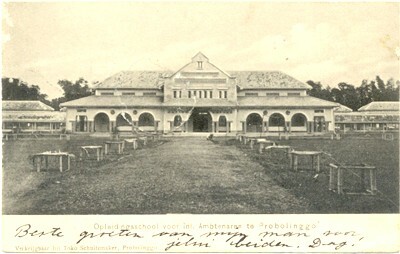 This is a picture of the school in Probolinggo. Below Ies in full glory amidst his students. 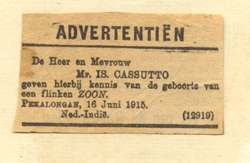 In 1922 the family Cassuto went for half a year leave to Holland. 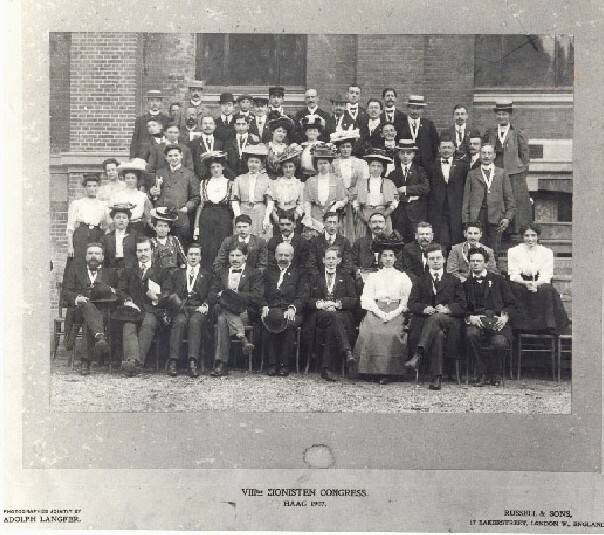 I guess this picture below is also taken during the Holland leave, considering the date of 1922 and the 'artistic'style. It is one of the most beautifull pictures of Lien to my opinion. 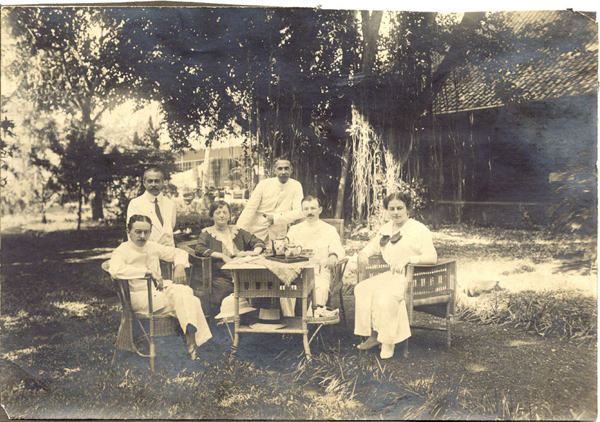 Back in Indonesia Ies had been stationed in Serang, in the West of Java. 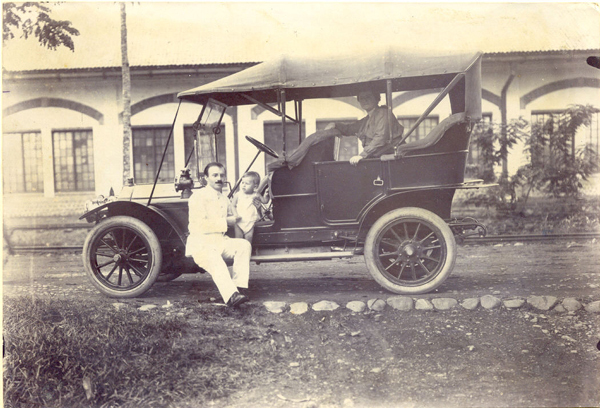 and Max, anno 1922; photo taken in Serang, in the west of the isle of Java, where Isaac was stationed for a short while, a suppose one or two years.